A statue of Confederate President Jefferson Davis stands in the Kentucky State Capitol Rotunda. Lexington attorney and former State Treasurer Jonathan Miller has begun an online petition seeking the change. Miller says Ali’s recent death has more people talking about his place in history. WKU Public Radio is carrying live coverage of Ali’s memorial service in Louisville Friday. You can hear that coverage from 1:00-3:00 p.m. central, 2:00-4:00 p.m. eastern time. 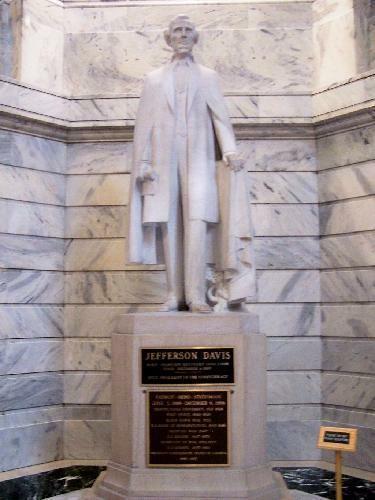 A statue of Confederate President Jefferson Davis will remain in the Kentucky State Capitol building’s rotunda. The Historic Properties Advisory Commission voted to keep the statue despite calls from Gov. Steve Beshear, Sen. Mitch McConnell, leaders of both legislative chambers, and the Republican and Democratic nominees for governor. Kentucky NAACP President Raoul Cunningham said that he was disappointed in the vote. “I don’t think you need a statue of Hitler in the state capitol to discuss the ills of Nazism or the Holocaust," remarked Cunningham. Calls to remove the statue began after a shooting in a historically black church in Charleston, South Carolina in late June. The incident prompted many southern states to re-evaluate Confederate symbols on state properties. Most Kentucky voters support keeping the statue of Confederate President Jefferson Davis in the state Capitol rotunda, according to Bluegrass Poll results released Monday. The state Historic Properties Advisory Commission on Wednesday will review recently gathered public comments on whether the Davis statue should be removed from the Capitol rotunda, which is considered a place of honor for notable Kentuckians. On Monday, the Bluegrass Poll showed that 73 percent of Kentucky voters think the statue should stay in the Capitol building; 17 percent said the statue should be moved to a museum, and 10 percent said they were sure. Dewey Clayton, a political science professor at the University of Louisville, said he was not surprised by the overwhelming support for the statue. President Barack Obama won't be attending Muhammad Ali's memorial service, but he and first lady Michelle Obama are sending a letter with a close aide to be read at Friday's service. White House senior adviser Valerie Jarrett will represent the president at the service in Louisville, Kentucky. The White House says Jarrett knew Ali personally. White House spokeswoman Jennifer Friedman says the Obamas are unable to attend because they'll be at their daughter Malia's high school graduation ceremony in Washington. Ali family spokesman Bob Gunnell says Ali's widow, Lonnie, and Obama have spoken by phone and that she appreciated the president's "kind words and condolences." Gunnell says two of Ali's daughters, Rasheda and Maryum, will speak at the service, as well as Islamic studies scholar Timothy Gianotti. Former President Bill Clinton, a longtime friend, will deliver the eulogy. The president of Turkey and king of Jordan joined the long line of world leaders, religious figures and superstars set to speak at Muhammad Ali's funeral Friday.